Keep yourself off the ladder and protect your home from water damage with Gutter Helmet, America’s #1 choice in gutter protection systems! Gutter Helmet of Northern Minnesota will sell, install and service the northern Minnesota counties of St. Louis, Itasca and Carlton, as well as the northwestern Wisconsin counties of Douglas and Bayfield. Gutter Helmet is now being sold and installed in northern Minnesota, as well as northwestern Wisconsin, under the name of Gutter Helmet of Northern Minnesota, which is owned by Dale Brenke, Chuck Kennedy and Holly Kuss. Dale Brenke, President, brings 23 years experience with Gutter Helmet and over 44 years experience in the home improvement industry with his company in southern Minnesota. 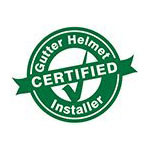 Additionally, Partner, Chuck Kennedy, and Partner, Holly Kuss, bring over 19 and 9 years respectfully, in selling and installing Gutter Helmet in southern Minnesota, as well as in the Twin Cities area. Keeping your gutters free from debris is an important part of maintaining your home. If you don’t keep them clear of debris, clogs can develop that prevent rainwater from flowing freely to the downspout. When rainwater goes over the sides of the gutter, this can cause rot in the walls and fascia board, erosion of the soil around your foundation and water getting into basements and crawl spaces. When we install the Gutter Helmet gutter protection system, you will never have to worry about this kind of damage to your home. Because the three partners have over 50 years combined experience installing, selling and servicing Gutter Helmet, we will ensure a positive experience for our customers with a product that will keep homeowners off the ladders permanently! Call us today to schedule your free, in-home consultation and NEVER CLEAN YOUR GUTTERS AGAIN!